This week in the Thought Leaders Think Tank community, we’ve been talking about micro pivots. There comes a time within our personal or professional lives when things feel “off” or stagnant. A micro pivot is a sliiiiight shift within the way we’re doing things to reflect our core values. It brings us a step closer to our purpose and provides more clarity. 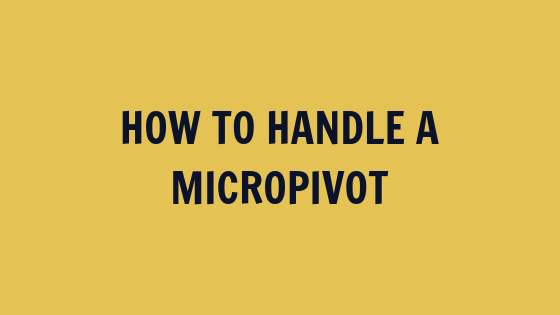 7:50 – 10:24: How do you know when you are ready for a micro pivot? 50:20 – 58:16: Homework and wrap-up! A pivot is a fundamental, high-level change within your business. It usually causes things like rebrands or business model shifts. 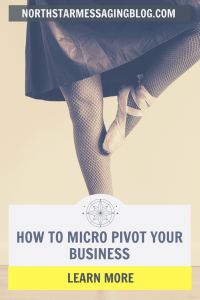 A micro pivot, on the other hand, happens when one or more of the key pieces of your business have a slight shift, Maybe you have a new understanding of your vision or mission. Maybe the audience you’re serving is changing slightly. Maybe you’re updating your content pillars to be more relevant. A micro pivot brings more clarity to your purpose. Bear in mind your North Star — those guiding principals and values you hold dear in your life — probably aren’t going to change much, but that doesn’t mean you won’t see some smaller tweaks in your business or leadership platform over time. As with anything, do you ever REALLY know when you are ready? In various aspects of your business (or life), things may start to feel just a little “off” or stagnant. You might be bored, or maybe you’ve given some strategies a good shake, but they just aren’t panning out. It’s time for a change or shift, and while you might be feeling a little nervous about it, you know that sometimes you’ve just gotta take the plunge. When you are ready for a micro pivot, don’t forget it’s an important time to set boundaries of what you want and what you don’t want from the shift. Last year, we loved our clients, were doing tons of fun work, and had really started stepping into our leadership shoes. But we were doing things the same way we always had. As a result, we were feeling super uninspired with our own business. After running a group program where the topic of leadership kept coming up and we started creating a framework around messaging for leaders, we finally felt like we were ready to embrace this new content pillar within our business. We did so in early 2018, and it’s allowed us to go deeper into our work, connect more fully with our clients, and create a greater impact. Micro pivots allow your to inch closer to your vision. When done well, they can truly reignite the fire within you — and within your audience. Your excitement puts energy into your community and allows it to grow. On the other hand, there are some challenges, and those can include the time it takes to determine the success or failure of a micro pivot. You want to make sure you give your changes enough time and data to see if they’ve had the desired outcome, so don’t get too antsy! The short answer: Full disclosure and transparency! Your audience wants to be part of your process — the good, the bad, and the ugly — so consider raising the curtain and taking them along for the ride. They’ll have ownership of the process and be cheering you along every step of the way. Want to catch the Leadership Forum when it goes live? Head over to the Thought Leaders Think Tank on Facebook and request to join.